Will Amazon Split Its Stock in 2019? The e-commerce giant hasn't looked at stock splits lately, but could this year be different? Many investors love to see stock splits from the companies in their portfolios. They understand fully that splitting a stock doesn't add any real value to a company, but they nevertheless see a decision to do a stock split as a sign of confidence from management that the future looks bright. Long-time investors in e-commerce giant Amazon.com (NASDAQ:AMZN) remember well how the company did stock splits several times early in its existence. Yet it's now been almost 20 years since Amazon last split its stock, and with the share price finally seeing some downward pressure after a huge run-up in recent years, some shareholders would love to get the encouraging signal that a stock split would send. Unfortunately for those who like stock splits, you have to go back to the boom times of the late 1990s to find the last time Amazon decided to split its shares. At that time, CEO Jeff Bezos and his team didn't hesitate to pull the trigger several times in short succession, with three splits occurring in just a year and a quarter. 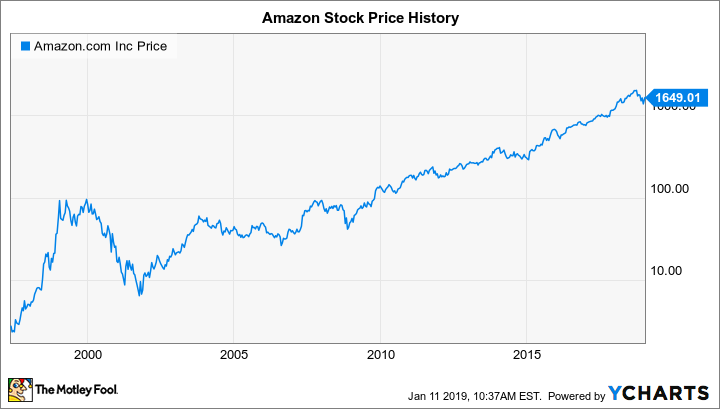 The result at the time was that rather than seeing Amazon's share price vault above $1,000, investors ended up with a total of 12 shares by late 1999 for every one they had owned in early 1998. Amazon's apparent strategy in setting stock splits was very much in line with prevailing wisdom at the time. The first stock split came almost immediately after Amazon shares hit the $100 per-share mark. The pace of gains accelerated in late 1998 and early 1999, and that prompted a more aggressive 3-for-1 split to knock down a stock price that had climbed above $150. Yet it only took months for Amazon to regain those past heights, necessitating another split. Data source: Amazon investor relations. Following the company's stellar rise, Amazon saw its stock lose a huge portion of its gains. By the early 2000s, as interest in internet-related stocks waned, Amazon stock saw its price drop into single digits. Even once it recovered, it took years for Amazon to get back to its former share-price levels. AMZN data by YCharts. Note: Prices are split-adjusted. It took nearly a decade for Amazon to return to its late-1999 peak for good. Yet as the economic recovery gained steam, Amazon was able to take advantage of steady growth in its e-commerce business to drive share-price gains. The rise of Amazon Web Services only accelerated the company's growth, and other initiatives further broadened Amazon's scope to create brand new opportunities for success. Yet throughout the rise that eventually sent the tech giant toward a $1 trillion market cap, Amazon has never done another split. Even a brief move in the share price above $2,000 during 2018 didn't prompt a move. CEO Jeff Bezos has historically shown no real interest in doing further stock splits. In communications with shareholders, he's acknowledged that Amazon looks at the question from time to time, but he has no plans to do a stock split anytime soon. The fact is that stock prices don't really matter too much anymore. It's easy to buy a single share of stock from a broker, and some financial institutions even let you buy fractions of a share. Amazon's high share price doesn't keep investors from getting into the stock if they want to. Will Amazon ever split its shares? Really, there's only one place left in the investing world in which a stock's share price matters: the Dow Jones Industrial Average. The much-followed benchmark is a price-weighted index, which means that the higher a stock's price is, the greater the influence it has on the benchmark overall. Amazon stands no chance of getting added to the Dow right now because its four-digit share price would give it an unfairly large weighting in the average. As recently as last year, the same 7-for-1 stock split that came into vogue in the mid-2010s would have worked to get Amazon shares into the right ballpark for admission to the Dow. Now, even after its slump, Amazon would still be among the top three Dow components in the recent past. It'd probably take a 10-for-1 split to get Amazon into the middle of the pack. The Dow doesn't look likely to get another opening soon, and even if it did, that opening would likely have to involve a tech stock for Amazon to get chosen to replace it. The average is already highly concentrated in tech stocks, and although many consider Amazon to be more of a consumer-goods player, the selection committee might not see it that way. Absent a Dow invitation, Amazon just doesn't look likely ever to do another stock split.